UK-Russian relations were a "factor" in the government's decision not to hold a public inquiry into the death of former Russian agent Alexander Litvinenko, Home Secretary Theresa May has said. 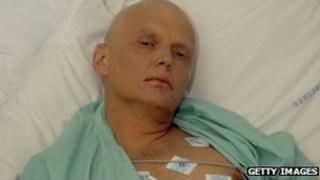 Mr Litvinenko was poisoned with radioactive polonium in London in 2006. Coroner Sir Robert Owen had requested an inquiry after ruling the inquest could not hear evidence of alleged Russian state involvement. Mrs May said diplomacy played a role but there were other factors. "An inquest managed and run by an independent coroner is more readily explainable to some of our foreign partners," she wrote in a letter to Sir Robert. At the request of the government, Sir Robert previously agreed to exclude certain material from his inquest on the grounds its disclosure could be damaging to national security. This meant the inquest would be unable to look at whether the Russian state was behind the killing or whether the British state could have done more to protect Mr Litvinenko. Sir Robert wrote to the justice secretary last month to request a public inquiry instead of an inquest, as the inquiry would allow evidence to be heard in secret. The Litvinenko family has called for a judicial review of the refusal to hold a public inquiry, saying the decision showed "utter contempt". But explaining her decision, the home secretary said the "integrity" of a coroner's inquest would be more "readily grasped" by foreign governments. She emphasised that such an inquiry would have "the power to see government material potentially relevant to their interests, in secret". However she wrote that the sensitivities of international diplomacy alone would not have prevented her going ahead, adding that a public inquiry would cost more and take longer than an inquest. Mr Litvinenko's family "would learn no more from an inquiry than they would from the inquest," she wrote. The former intelligence agent, 43, died after he was poisoned while drinking tea with two Russian men, one a former KGB officer, at a London hotel in 2006. His family believe he was working for MI6 at the time of his death and was killed on the orders of the Kremlin. The inquest into his death has already faced major delays because both the UK and Russian governments have been slow to disclose documents. Police have sought the arrest of two Russian nationals in relation to the death, Andrei Lugovoi and Dmitri Kovtun, both of whom deny any involvement. The Russian authorities have rejected requests to extradite the two men. Alex Goldfarb, a friend of the Litvinenko family, recently said there had been "some sort of collusion behind the scenes with Her Majesty's government and the Kremlin to obstruct justice".